I had so much fun working out poems with my books today. If I ever write a book though, I’m giving it a title with verbs! I used to play a game similar to this when I worked in the county library. It made shelving quite a bit of fun. 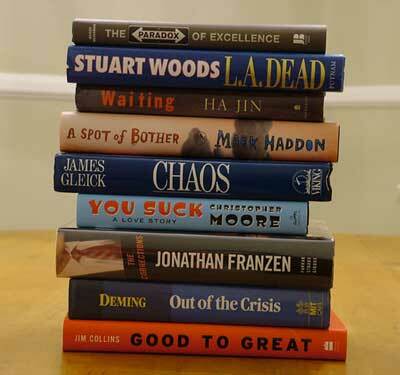 I read the note that said to insert a to define the line length in the Spine Poetry title box. Tried to do it, could not figure it out. Poetry depends a great deal on how the lines are defined. Is there any better description on how to do this? Thanks. I finally realized that one doesn’t use an “insert” function, but actually types in the characters ‘less than’, the letters ‘br’ and the ‘ greater than’ and the text reader will interpret them. We’ll need to have some way to view your images … if you have a film camera you can take pictures and scan them in, certainly! Okie Dokie. I used a blurry pic. Well, nobody ever said it had to be a good one! Couldn’t get the break thing to work so had to use /. It worked when I used it on my photo but was lost somewhere between there and the contest page. Gremlins! Ahh! Pity upload fail kept me from participating – perhaps next year, then. Sad, I uploaded mine in time and it does not appear at all. I tagged it and everything, something failed I know it is too late to win but wish it had made the gallery at least.